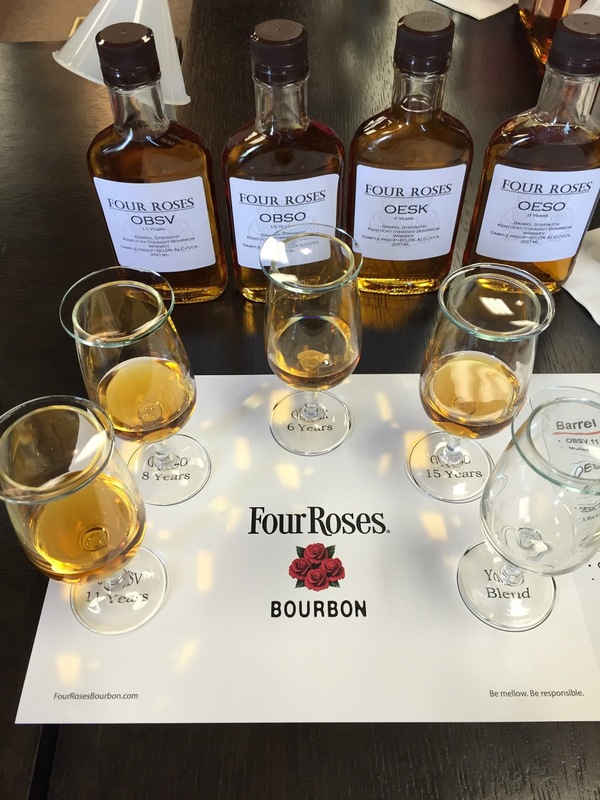 Kentucky Bourbon Affair 2015 – Blending (and more) at Four Roses. 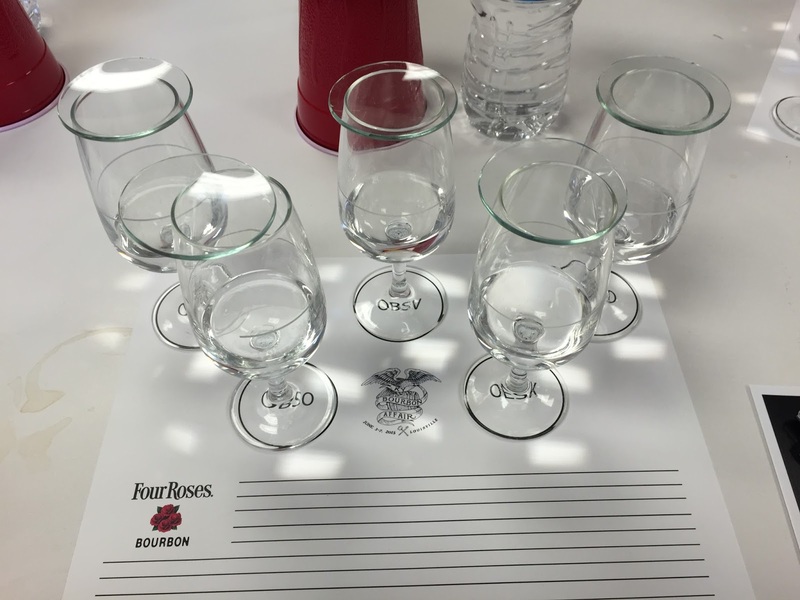 When I saw the chance to get behind the scenes at Four Roses and try my hand at blending as part of the Kentucky Distillers’ Association Bourbon Affair, I knew that I had to be there. My previous posts have probably made it clear that I’m already a fan of Four Roses and its Master Distiller, Jim Rutledge. Jim has been the Master Distiller at Four Roses for 20 years, and before then, he already had 30 years of experience with Seagram’s where he started in Research & Development in Louisville, before moving with Seagram’s to New York and finally to Lawrenceburg, Kentucky. I’ve been able to meet Jim at a number of private barrel selections and Four Roses events, but this Kentucky Bourbon Affair offered something that I might never experience again: I ended up sitting right next to Jim as we worked on our own personal blends of different Four Roses recipes. I had also already met Bourbon Hall of Famer Al Young too, and I enjoyed his 2010 book Four Roses: The Return of a Whiskey Legend about the history of Four Roses, but I’d never had access to him like this before. After a light breakfast and a greeting from Jim, Al himself took a small group of us on a behind-the-scenes tour. Al regaled us with stories from when he was Distillery Manager and how a sixth sense is needed to operate a distillery. He also answered some technical questions that true enthusiasts need to know, like the proof of new make and proofing it down before barreling; speculation about whether a Four Roses Rye is in the works; the number of barrels and recipe percentages in the Four Roses Small Batch; and much, much more. 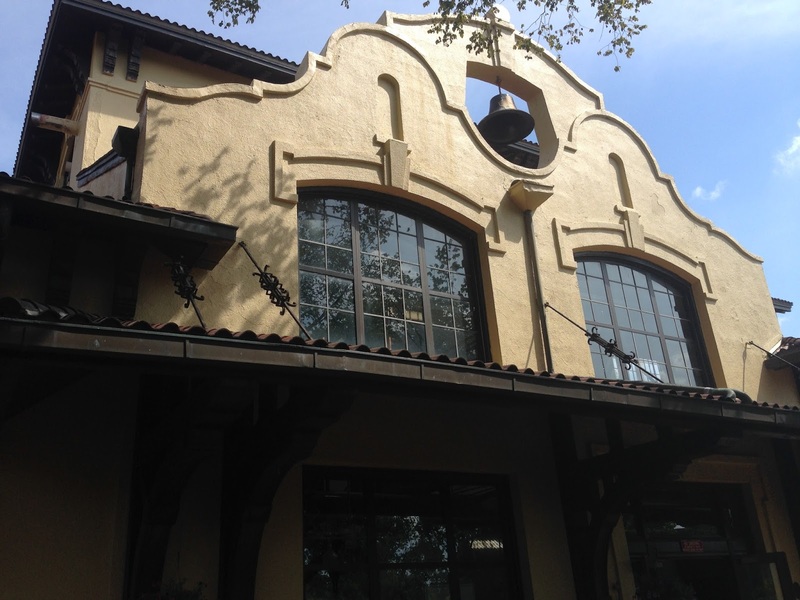 We walked from the gazebo to meet with Ashley Jones, Quality Control Manager, who took us through tastings of new distillate of OBSQ, OBSV, OESO, OBSO and OESK. Even as distillate, we could really tell the differences between the floral and perfume notes of the Q yeast, the fruitiness of O and V, and my favorite, the spiciness of K. We also learned about the yeasts, quality control, and the tasting panel that reviews each run. 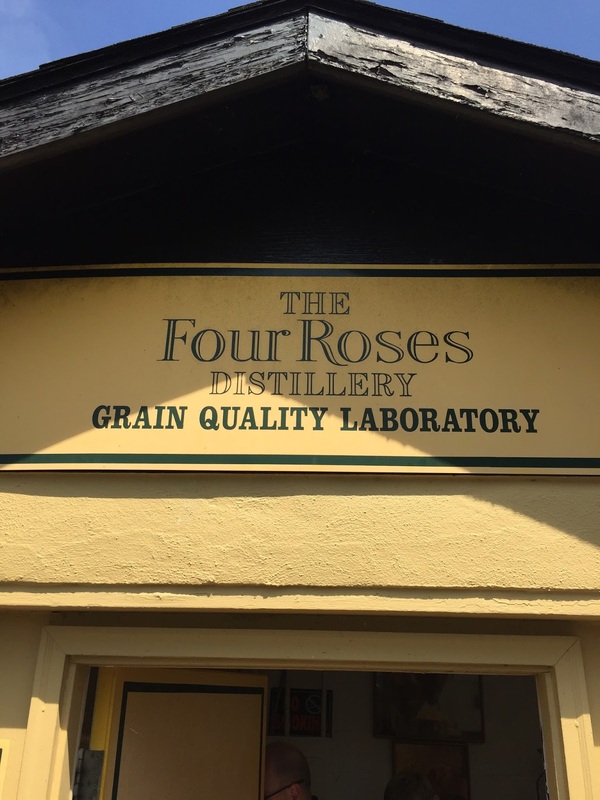 Al took us from Quality Control to the Grain Quality Laboratory, which is a big name for a pretty tiny building, where we learned about the non-GMO corn, rye, and barley used by Four Roses. Next up was the Control Room and the Fermenter Control Room, where we learned the finer details of fermentation, temperatures, and the magic task performed by the yeast. 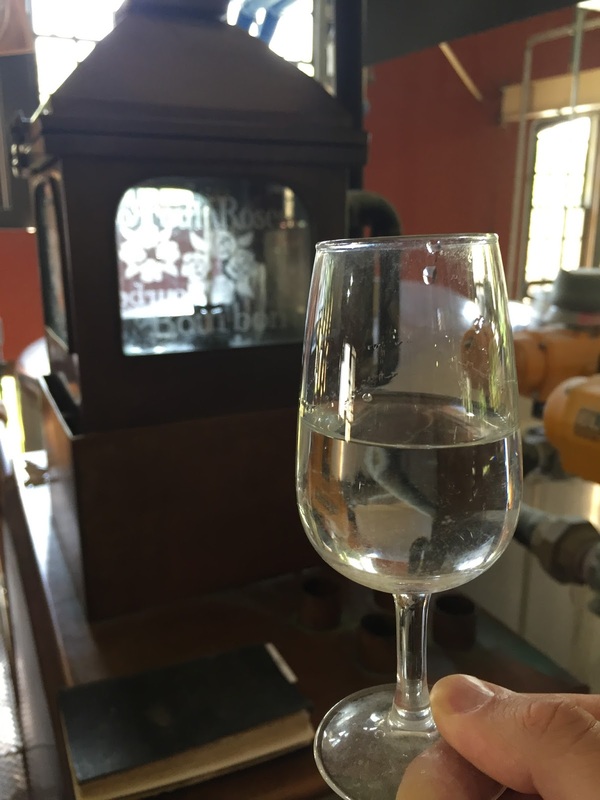 We toured the production equipment, learning along the way that because Cypress is endangered, a move has been made to Douglas Fir, learning the proper way to stick your finger into a stream of mash, and tasting the difference in mash sweetness when it is pumped in versus its sourness later in life. When we reached the tail box, a run of OESV was coming off the doubler. We measured it at 73 degrees, with a 147 reading on the hydrometer, and using an archaic-looking Gauging Manual, we calculated the proof at 142. There have only been a few times in my experience when “white dog” off the still is anything other than harsh fire in the mouth; this OESV was one of those good experiences. This distillate even had a flavorful finish beyond the expected warming sensation. The best was still to come after lunch, however. 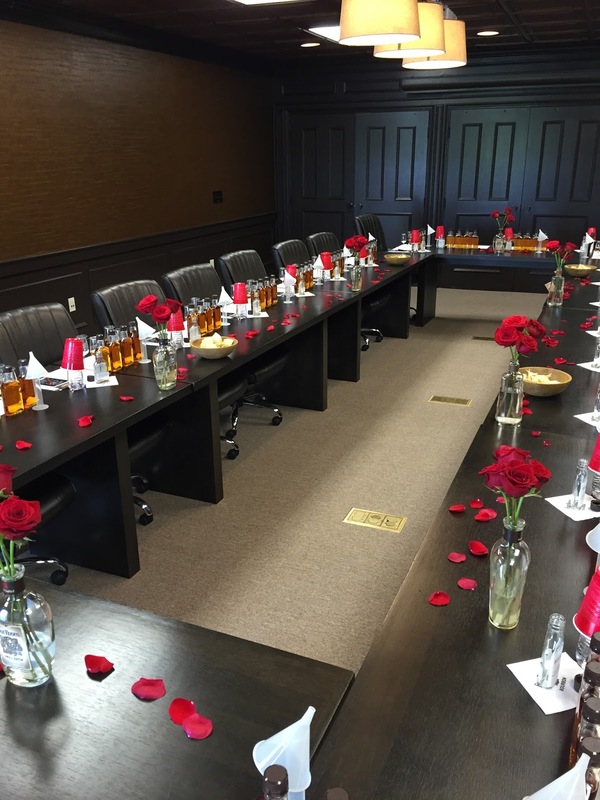 The boardroom had been set up with half-pints of an 11-year OBSV, an 8-year OESO, a 6-year OESK, and a 15-year OBSO for each of us to create our own individualized small batch. Jim also gave us the inside scoop on blending his different recipes, and he shared stories about how different recipes can complement each other, can do surprising things to each other, or can be difficult to fine-tune. For instance, the 2014 Limited Edition Small Batch took upwards of 70-100 test blends (depending on who you ask) before it was finally selected. This year, however, the 2015 Limited Edition Small Batch was set after only 16 test blends. I was hoping for an advanced tasting of this 2015 Limited Edition – which will be a 16-year OBSK, a 15-year OESK, a 14-year OESK, and an 11-year OBSV – but sadly, it was not to be. In the meantime, I had my own Very Limited Edition to create. As a blending novice, I gravitated toward the yeast strains that I knew I preferred – the K and the V – so my first few test blends were heavier on those components. I landed on 40% OBSV 11-year, 40% OESK 6-year and 20% OBSO 15-year, which, unabashedly, I thought was excellent. However, I was sitting right next to the master himself, and he whipped up a concoction in a single attempt that blew away my blend. Jim used 50% OBSO 15-year, 35% OESO 8-year, and 15% OBSV 11-year for a blend that was absolutely phenomenal. Needless to say, he knows what he’s doing folks. Yellow Label: red apple, country ham, white cheddar cheese, white chocolate, and walnut. Small Batch: orange, raspberry, bacon, aged parmesan, milk chocolate, and cashew. Single Barrel: dried cherry, pepperoni, smoked gouda, dark chocolate, and almond. This fun exercise involves taking a small sip of Bourbon (neat) to acclimate your taste buds. Then take a small taste of one of the foods followed by another sip of Bourbon. Each of the foods accentuates existing flavors of the Bourbon in its own special way. Some cheeses can coat the tongue and mute the sharpness or burn, while at the same time helping you identify rich caramel and cocoa flavors; fresh or dried fruit will lead you to very different sensations; nuts can help you identify toasted, vanilla and shortbread flavors; chocolates coat the mouth and, surprisingly, aren’t limited to just identifying sweet notes; and the saltiness of fatty cured meat can help you identify drier, oaky and nutty flavors. You can explore flavor wheels with different foods in these categories, although I strongly recommend switching out the cured meat for sorghum or fresh local honey, which can accentuate orange, caramel, and sometimes earthy or grassy flavors. Again, these flavors are already in Bourbon; these small tastings just help you identify those flavors that perhaps you’ve previously found hard to describe. This exercise is also useful in creating “flavor memories” and helping you decide on pairing certain Bourbons with different appetizers or meals. 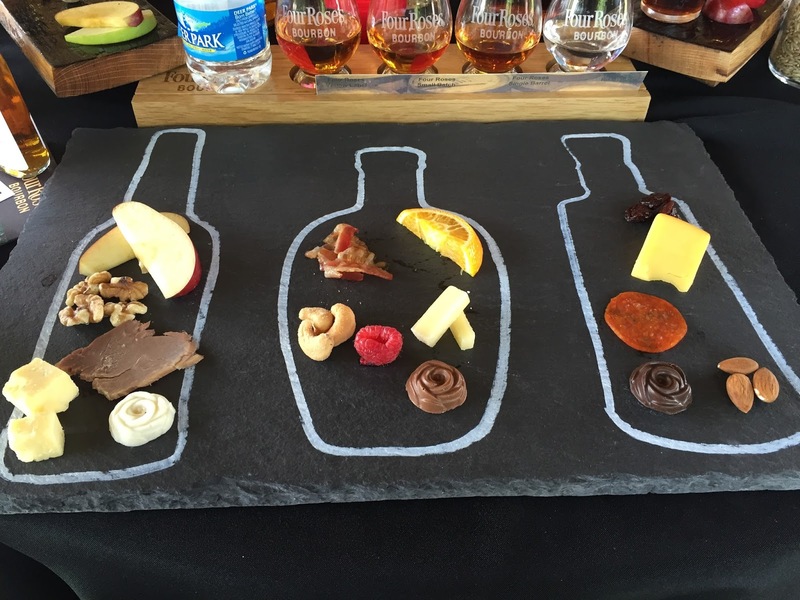 The flavor wheel closed our Bourbon Affair at Four Roses. It was a more than a full day supply of Bourbon adventure, with incredible experiences and memories. This also set the bar pretty high for the Kentucky Distillers’ Association and future Bourbon Affairs. I suspect that each Bourbon Affair will try to out-do previous years, so I highly recommend that you mark the 2016 Kentucky Bourbon Affair on your calendar. ← Kentucky Bourbon Affair 2015 – Crab & Crawfish with Bill Samuels, Jr. and Maker’s Mark. Great write-up. That is one amazing experience. Jim is a master. I have fallen in love with Four Roses over the past year or so. I was just at the distillery a few weeks ago. I was going back-and-forth between an OESK gift shop bottle and the OBSQ you have pictured above. 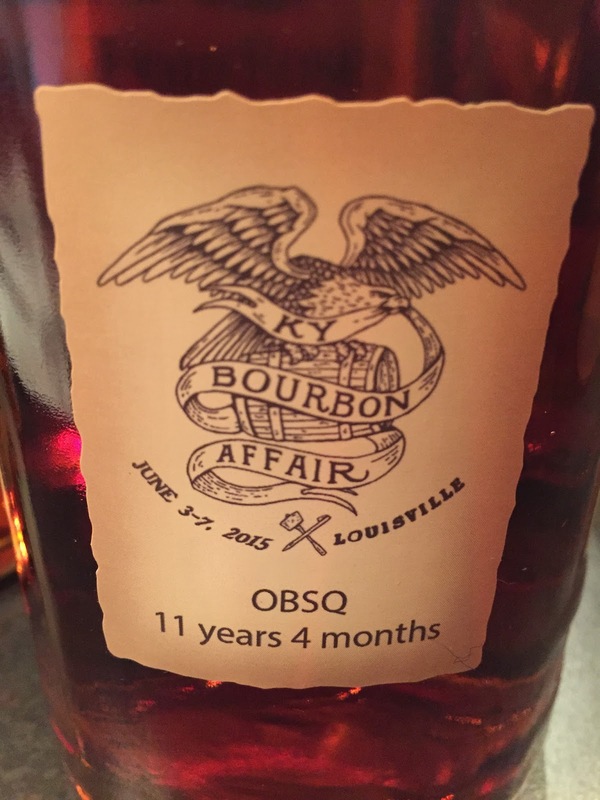 And, I figured there was something special about/I wanted to experience a little bit of the Bourbon Affair since I could not go, so I picked up the OBSQ. I have not opened it yet. Was there something special about this bottle and the BA? Have you tried it yet? I am a little curious to know more before I open mine. Thanks for sharing your experience. I would have been tempted by the OESK too — it's one of my favorites. I picked up the Bourbon Affair OBSQ to commemorate my visit and because Jim selected it. I would probably pass on a store-selected OBSQ without sampling it first, but it's easy to trust Jim's selections. I haven't had a chance to open it yet, but I have high expectations. Thanks for reading and for the feedback!